retirement of Red Cross volunteer of 20 years, Jackie Jones. Over the last 7 days, the Greater New York Red Cross provided emergency assistance to 109 adults and 33 children following 46 local disasters. Here are some highlights from last week and a preview of upcoming activities (see below). On Sunday night, Newsday reported that a small plane crashed in a Valley Stream neighborhood. Red Cross provided canteen support for first responders. Earlier in the day an intense fire tore through a Valley Cottage condominium and displaced 15 families. Two affected families are being helped by the Red Cross. On Friday, Red Cross Greater New York CEO, Josh Lockwood, along with Service to the Armed Forces staff members provided gift cards at a baby shower for expectant military moms at the Manhattan VA hospital. Broadcasting & Cable magazine recognized the creativity behind the Bleed For The Throne blood drives which brought in over 350,000 pints of blood! Our Emergency Preparedness Team spent the entire day Thursday at Brooklyn Technical High School providing Emergency Preparedness training to 4,000 students! Thank you, Brooklyn Tech High School, for your partnership. 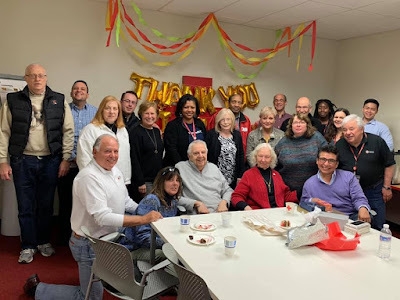 On the same day, Red Cross Metro New York North Chapter celebrated the retirement of longtime volunteer, Jackie Jones. With nearly 20 years of service, the Red Cross thanks you for being the true definition of compassion. On Wednesday, Red Cross met with Marsh & McLennan Companies to discuss leadership development as well as our Red Cross mission and volunteers, service delivery and customer service. Red Cross partnered with Assemblywoman Kimberly Jean-Pierre to record a PSA, as part of Sound the Alarm to install thousands of free smoke alarms. Our Summer 2019 Unpaid Internship Program is open for applications! Red Cross Internships are a rare opportunity to explore and enrich your future career prospects while serving others. Our 10-week Summer Program is open to undergraduate or graduate students. The program starts Monday, June 3. Click here to apply. We are actively recruiting for the following volunteer positions: Volunteer Screener, Home Fire Campaign Team Member, Disaster Action Team Member, Recovery Caseworker, and Community Preparedness Education Program Team Member. Apply today at www.redcross.org/volunteer! For more information, please contactrecruitmentgny@redcross.org. April 16, 19, 22: Red Cross blood drives will take place from 2 to 7 p.m. at the Greater NY Red Cross building located at 520 West 49th Street, Manhattan. Schedule an appointment to donate today! May 1: Every day seven people die in home fires and the Red Cross wants to do everything we can to prevent these needless tragedies. Red Cross in Greater New York will be hosting Sound the Alarm events at locations in Manhattan from 9:00 AM to 5:00 PM. Please sign up to volunteer.